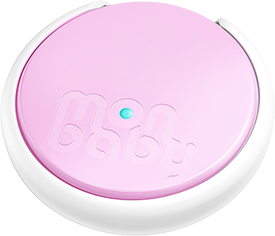 MonBaby, a smart breathing monitor for babies, helps parents monitor their infants while they are sleeping. With Big Apple Buddy’s personal shopping service, you can now buy direct from the MonBaby online store anytime, anywhere. MonBaby’s wearable monitor snaps onto any clothing article, and can be used as your child grows. The button works together with a smartphone app to track your baby’s sleeping patterns and presents the data in an easy, understandable manner. MonBaby will tell you about your child’s breathing movements, body position, proximity removal, and more - you simply choose which alerts you want to receive. This baby monitor will help ease the nerves of anxious new parents! Unfortunately, the USA MonBaby online store does not currently offer international shipping. However, Big Apple Buddy, your personal shopper, can help you buy products direct from the official USA MonBaby online store and ship them to your doorstep, no matter where you are in the world. If you would like to buy from the USA MonBaby online store, simply let us know which items you would like to order (by filling out the form below) and we’ll get back to you with a free international shipping quote within 24 hours!